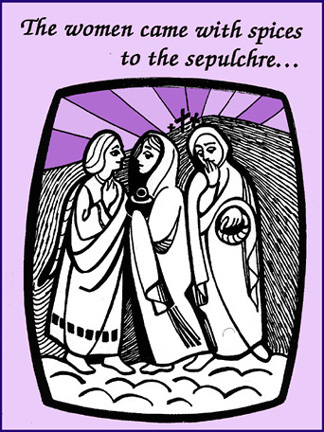 Holy Saturday (in Latin, Sabbatum Sanctum), the 'day of the entombed Christ', is the Lord's day of rest, for on that day Christ's body lay in His tomb. We recall the Apostle's Creed, which says "He descended unto the dead." It is a day of suspense between two worlds, that of darkness, sin and death, and that of the Resurrection and the restoration of the Light of the World. For this reason no divine services are held until the Easter Vigil begins that night. This day between Good Friday and Easter Day makes present to us the end of one world and the complete newness of the era of salvation inaugurated by the Resurrection of Christ. Ideally, Holy Saturday should be the quietest day of the year (although this is not as easy in a busy household with children as it might be in a convent or monastery.) Nightfall on Holy Saturday is time for joy and greatest expectation because of the beautiful liturgy of the Easter Vigil, often referred to as the Mother of all Holy Vigils, or the Great Service of Light. The Easter Vigil was restored to the liturgy in 1955, during the liturgical reform that preceded the Second Vatican Council. During the day, the preparations at home that must be made for Easter Day are appropriate, however, because they keep our attention fixed on the holiness and importance of the most central feast of the Church. Working with our children to prepare for Easter can offer us many 'teaching moments', as well. As with Christmas, the secular aspects of the Easter season threaten to overwhelm its religious significance. And as in Advent, which is a penitential season also, the solemnity of the events we celebrate during Holy Week risk being obscured by the advance preparations that we may make for the joyous celebration of Easter. As Catholics, we need to keep this in mind, and not put out the Easter decorations before Easter. Holy Week and especially the Triduum (Holy Thursday, Good Friday, Holy Saturday) are so rich with meaning that we must be careful not to lose any of it, and to make our observances fit the solemnity of the celebration. But any festive celebration (and Easter is our greatest cause of rejoicing) takes advance preparation. Most American families observe Easter customs and traditions, but the religious significance of many of these may be lost. For example, new Easter clothes. It was part of the baptismal ceremony (and a token still remains) that the candidates for baptism (catechumens) were given a new white garment to wear  both its newness and its whiteness signifying purity. It may seem that Easter is just another excuse for merchandizing (so does Christmas). But we Christians need not regard wearing new or special Easter clothes simply as commercialism or vanity. Christians should try to keep in mind, when wearing something new for this holiday, our New Life in Christ. And we should do our best to make our appearance match the joyousness of the greatest feast of the Church. The Christian symbolism of Easter bunnies might seem pretty obscure, and it's easy to suppose that the rabbits are simply a pagan symbol of fecundity taken over by Christianity. Even if so, bear in mind that the ancestors of pre-Christian (even pre-historic) pagans at some time knew about the true God  Adam and Eve and Noah, for example. Pagan beliefs about God's action in the world and about man's true destiny were far from the truth, of course, but many things can be understood through basic human intelligence  and that intelligence comes from God. The coming of spring is a cause for rejoicing for everybody, whether Christians or non-Christians. The Easter bunny is actually a pretty good symbol of God's plan for His creatures (including humans) to "be fruitful and multiply", and of the renewed exuberance of all creatures in cooperating with God in creating new life. (The Easter bunny might seem to be more a metaphor for God's plan for His creation in Genesis than in the Gospels.) Maybe we should think of the fecundity of rabbits as a symbol of evangelizing, and the many new believers God desires. We could think of the eggs the Easter rabbit carries in a basket as representing Christians carrying the message of Christ into the world. The Easter egg is a symbol of the Resurrection. The shell represents the tomb that could not contain the Resurrected Lord. The chick that bursts forth from its lifeless shell is a metaphor for the mystery of Christ's Resurrection. Filling baskets with colored Easter eggs is a nearly universal custom in Christian countries, and there are nearly as many traditional ways to dye and decorate eggs as there are ethnic groups. From the very elaborate and expensive Easter eggs made by the jeweler Fabergé for the Russian czar in the nineteenth century, to the intricately etched pysanky eggs of the Ukraine and similarly distinctive egg-decorating customs of eastern Europe, to the simple (if messy) kitchen-table food-coloring dyed eggs most Americans know, the Easter egg is revered as a symbol of the Resurrection. While your family probably has its own traditions about the best way to do Easter eggs, there are web pages and articles and library books on the subject, that might give you some new ideas. One idea is to paint one of the eggs gold and write Alleluia on it. The child who discovers the Alleluia egg might be given a special honor, such as lighting the Easter candle at mealtime. In some parishes there is a custom of bringing filled Easter baskets to the Easter Vigil, and, after Mass, the priest blesses all the baskets  and the eggs, candy, Easter breads or flowers they contain  with holy water. If your parish doesn't do this, or if your children are too young to go to the Easter Vigil, you might want to do this with your children when they set their baskets of eggs out for hiding before bedtime on Holy Saturday. A simple sign of the Cross with holy water could be made by each child on his own basket. bringing the spices which they had prepared and they found not the body of the Lord Jesus. The night vigil of Easter signifies Christ's passage from the dead to the living by the liturgy, which begins in darkness (sin, death) and is enlightened by the fire and the candle representing Lumen Christi  the Light of Christ  just as the Church, the Mystical Body of Christ, the community of believers, is led from spiritual darkness to the light of His truth. Christ's baptism, which our own baptism imitates, is represented during the liturgy by the blessing of the water of baptism by immersing ("burying") the candle representing His Body into the font. During the liturgy we recall God's sparing of the Hebrews whose doors were marked with the blood of the lamb; we are sprinkled with the blessed water by which we were cleansed from original sin through Christ's sacrifice, and we repeat our baptismal vows, renouncing Satan and all his works. We rejoice at Christ's bodily resurrection from the darkness of the tomb; and we pray for our passage from death into eternal life, from sin into grace, from the weariness and infirmity of old age to the freshness and vigor of youth, from the anguish of the Cross to peace and unity with God, and from this sinful world unto the Father in heaven. The Easter Vigil includes a blessing of water. The water is a sign of purification and of baptism. Holy water, that is, water that has been ceremonially blessed, is a sacramental. Sacramentals are "sacred signs which bear a resemblance to the sacraments [by which the faithful are] given access to the stream of divine grace which flows from the paschal mystery of the passion, death, and resurrection of Christ  the fountain from which all sacraments and sacramentals draw their power." [Constitution on the Sacred Liturgy, No. 60. Second Vatican Council Documents] Some other common sacramentals are blessed palm (and the ashes used on Ash Wednesday made from them), candles, medals, priestly blessings, and other prayers. Water blessed during the Easter Vigil is used for baptisms and other blessings. This water does not last the whole year, so there is a special blessing for holy water used at other times of the year, also. Traditionally the blessing of holy water includes an exorcism, or protection against evil, and the addition of salt, a spiritual symbol of wisdom, which preserves our faith. Catholic churches have basins or fonts containing holy water near the entrance so that believers can dip their fingers in it before making the sign of the cross as they enter the House of God as a symbol of purification. This simple gesture reminds believers of their consecration to Christ in baptism, and visibly indicates their acceptance of the Catholic faith. The blessed water is available for members of the parish to keep at home to use for special prayers and blessings. In European Churches there are usually large stone basins filled with holy water near the entrance which are used by people in making the sacramental sign and also serve as reservoirs. A bottle of holy water used to be found in virtually every Catholic home, but the private use of holy water has diminished, probably because people no longer know what it is used for or how to use it. However, it is a very powerful sign and children especially love to learn to use holy water to bless a wreath or flowers or other special religious articles used in the home as a sign of consecration to the Lord. It would be good to have a small bowl or font of holy water near the entrance door of the house for family members to use during the penitential season of Lent. The Paschal candle represents Christ, the Light of the World: "I am the light of the world. He that followeth me walketh not in darkness" [John 8:12]. The pure beeswax of which the candle is made represents the sinless Christ, who was formed in the womb of His Mother. The wick signifies His humanity; the flame, His Divine Nature, both soul and body. Five grains of incense inserted into the candle in the form of a cross recall the aromatic spices with which His Sacred Body was prepared for the tomb, and of the five wounds in His hands, feet, and side. During the Easter Vigil on Holy Saturday night the priest or deacon carries the candle in procession into the dark church. A new fire, symbolizing our eternal life in Christ, is kindled, which lights the candle. The candle, representing Christ Himself, is blessed by the priest, who then inscribes in it a cross, the first and last letters of the Greek alphabet, (Alpha and Omega - 'the beginning and the end') and the current year, as he chants the prayer below. He then affixes the five grains of incense. The Easter candle is the largest and most beautiful in the Church. It is a reminder of the Risen Redeemer "who shining in light left the tomb". It is lighted each day during Mass throughout the Paschal season until Ascension Thursday. In Rome, the wax of the Easter candle from St. Peter's is used to make little locket-like Agnus Dei (Lamb of God) medals. The heart-shaped gold-colored locket is embossed with a cross and a lamb and contains a drop of blessed wax. Let us pray. May Thy abundant blessing descend upon this lighted candle, we beseech Thee, almighty God: Look down on it shining in the night, that the sacrifice offered this night may shine by the secret mixture of Thy light; and wherever this mystically blessed object shall be brought, may the power of Thy majesty be present, and may all the deceitful works of Satan be driven out. Through Christ our Lord. We pray thee, Lord: may this candle consecrated to thine honor continue with undiminished light to dispel darkness. Receive it as a fragrant and pleasing offering, and let its light mingle with the lamps of heaven. Amen. May the morning star behold its flame  that morning star who knows no setting, who rose from hell and gently shines on man. Amen. Who is Christ the Lord, Amen. Following the blessing the family might recite the Litany of the Saints, another traditional prayer used during the Easter Vigil. He is risen as He said, Alleluia! Women for Faith & Family. All rights reserved.